Short of your reading your judge’s thoughts, the next best thing is Docket Alarm’s Analytics Platform for the Patent Trial and Appeal Board. Docket Alarm offers attorneys analytics and statistics that gives insight into the mind of a PTAB judge. Attorneys can see trends among the busiest PTAB judges. Users see the top PTAB judges along with the number of proceedings, their top tech center, the judge’s petition institution rates and their claim cancellation rates. Judges can be ranked according to any of these factors. Users can select a judge appearing to get a full judge profile. Each PTAB judge has an individual profile page that provides users with an in-depth analysis of the judge’s activity, giving users the ability to easily analyze the outcome of their cases and devise winning litigation strategies. Attorneys can view statistics related to every stage of a proceeding, from institution to final written decision. 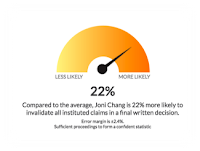 Users can see month-to-month histograms of the rate at which the judge institutes petitions in whole or in part, the average number of claims instituted, and even the average number of days it takes for a judge to make a decision. Any judge’s statistics can easily be compared to the overall average, so you can see if a judge is faster or slower than others. In addition, attorneys also have access to statistics that illustrate whether, compared to other judges, a judge is more or less likely to rule on a matter for or against a party. 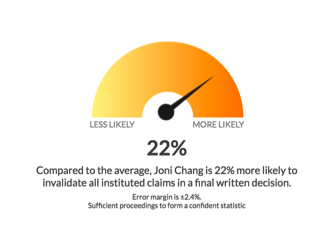 For example, Judge Joni Chang is 22% more likely to invalidate all instituted claimsin a final written decision than the average PTAB judge. Litigators can use these types of statistics to get an idea of how a judge will rule on particular actions and motions in a proceeding, allowing them to create strategies that maximize their chance for success. Docket Alarm is the only research platform that offers patent practitioners a complete PTAB research and analytics platform. Add intelligence to your patent practice today by signing up at http://www.docketalarm.com.